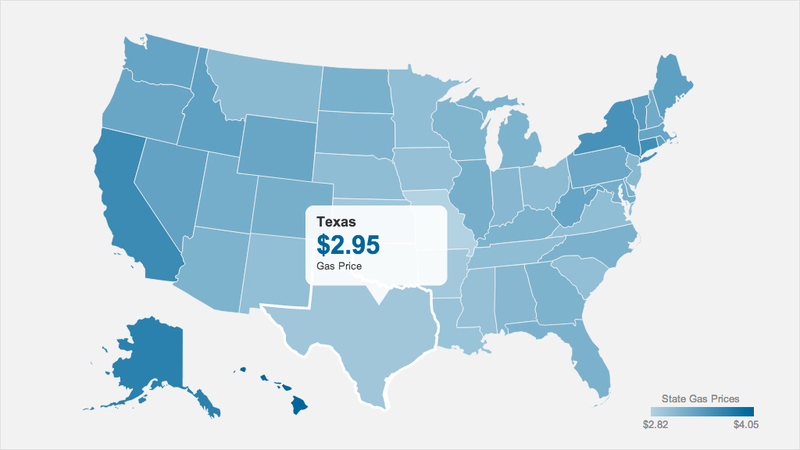 Click on map to find the gas price in your state. It's becoming easier and easier to find gas for less than $3 a gallon. The average price of a gallon of regular gas now stands at $3.19, according to AAA, after falling by about a penny a day for the last week. The steady decline has taken the average price below $3 already in six states -- Missouri, Oklahoma, Arkansas, Texas, Kansas and Louisiana. Another six states are enjoying an average price within a nickel of that benchmark and could dip below three dollars soon. But $3 gas isn't just limited to these 6 states. Nearly 20% of gas stations nationwide are already charging less than $3 a gallon for regular gas, according to the Oil Price Information Service. And those stations are selling far more than their share of gas. "In almost half the states, you don't need to make a great effort to find gas at $3 or less," said Tom Kloza, chief oil analyst for OPIS, which compiles the price data for AAA, as well as for GasBuddy.com. Related: What's the price in your state? "To a great extent, the averages are really misleading," said Kloza. "A large station with cheap prices might sell 750,000 gallons a month, while a small independent station with high prices might be struggling to sell 100,000 gallons. The increased supply of low-price crude from Canada and North Dakota is a major factor sending gas prices lower, Kloza said. "We're seeing the cheapest crude on planet here," he said. A quiet hurricane season and the lack of other disruptions at refineries has kept gasoline inventories high. The national average is already below 2012's low of $3.21, and has been averaging about 25 cents a gallon less than last year's prices for much of this year. Kloza estimates that gas prices will continue to fall through the end of 2013, and that more than half of states will have an average price below $3 a gallon before Christmas, which is generally when prices bottom out for the year. While high-price states like California and New York might keep the national average just above $3, Kloza said there is about a fifty-fifty chance that the national average could drop below $3 for the first time since late 2010.